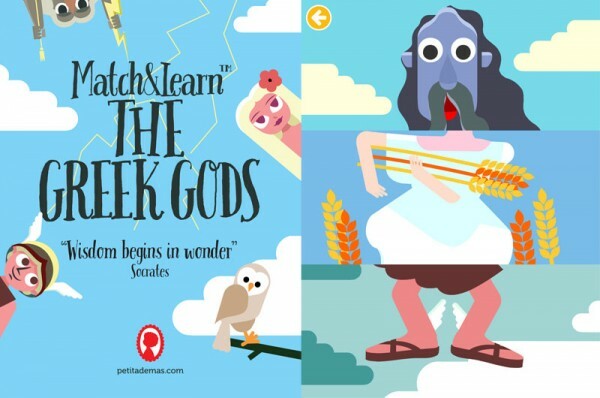 If you’re a fan of the wonderful Greek legends you’ll be thrilled to discover this new app ‘Match and Learn The Greek Gods’. This delightful introduction to the characters of Greek mythology will have your little one clamouring to hear more about their new favourite characters. 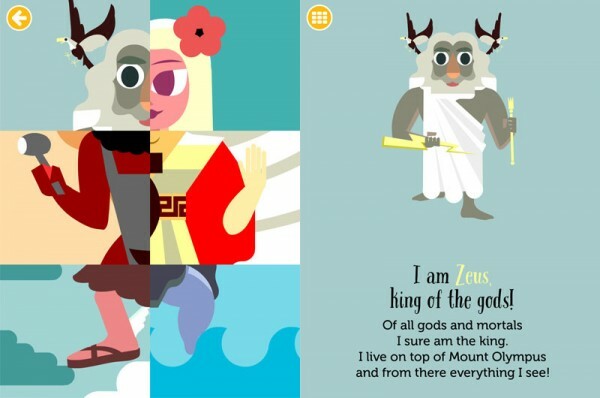 The folk at Petita Demas have created a fun and engaging app to help kids get to know the characters from the Greek legends. Bright illustrations, whimsical music and simple puzzles will mostly appeal to kids between two and four years. Twelve of the Greek Gods are featured, including well-known characters such as Zeus, Hera, Poseidon and Aphrodite as well as some less well known such as Hephaestus and Demeter. The three mix and match games – Three Slides, Six Tiles and Time Attack – challenge kids to match the body parts of the characters, much as they would with a flip book. Fun sound effects let the child know when they’ve found parts that match. When the character is complete a short poem appears and the text is highlighted as it is narrated, a brilliant way of encouraging letter and word familiarization in early readers. The quirky and fun illustrations are really what bring this app to life and are sure to bring a smile to your face as much as your child’s. The colours are fresh, bright and modern whilst the app is easy to use and ideal for little hands to master. Available from the App Store for $2.99.